4-star-hotel in the 9th district of Budapest. Address: 1094 Budapest, Tompa u. 30-34. The hotel has 182 rooms. Hotel Leonardo Budapest **** with 182 air-conditioned rooms, close to the city center. 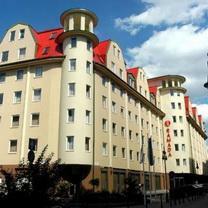 Hotel Leonardo Budapest **** opened its doors in 2004 with 182 air-conditioned rooms close to the city center. The hotel offers 182 guest rooms, including 25 superior rooms, 15 suites and 4 rooms for disabled guests. Amenities: Each room is air conditioned and has a safe, two telephones, an ISDN line, satellite TV, In-Room movies, a minibar, a work desk and a hairdryer. The hotel also has a banquet and conference room for up to 100 people. All three rooms are air-conditioned, illuminated with natural light and equipped with modern audio-visual equipment. The Courtyard Restaurant serves international and Hungarian cuisine for breakfast, lunch and dinner. The 42nd Street Bistro Bar serves breakfast and A'la Carte for lunch and dinner. In summer, guests can enjoy international cuisine on the terrace. 24 hour reception; garage; pets allowed; Internet; coffee shop; gym; air conditioning; laundry; non-smoking room; currency exchange; sauna; safe; room service; closed parking.